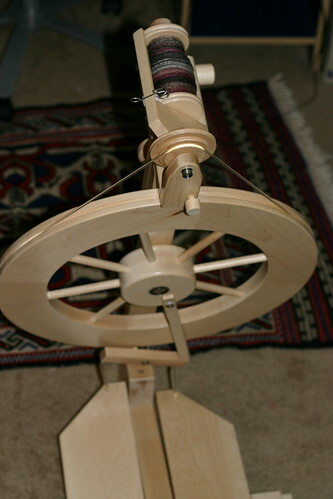 was selling her Lendrum DT on Ravelry, and although I’d never spun on any kind of wheel, I had read such good things about the Lendrum wheels that I couldn’t pass hers up. So here it is!! Handsome, no? Here’s a side view. As you can see, I got busy right away. It was really easy to set up with instructions right out of the box. I started off doing the “park and draft” on the wheel but as I got more comfortable, it went much faster! I finished up the Spunky Eclectic BFL roving in Mahogany that I was spinning on my spindle, to get a comparison of the feel of the same fiber on the wheel. 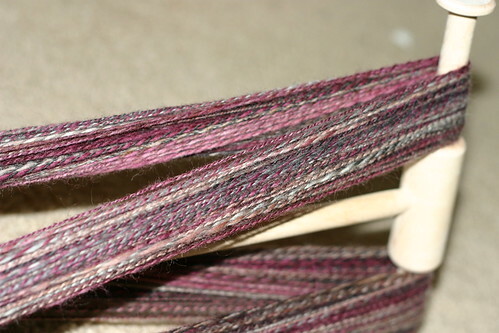 It was more thick and thin, overspun and underspun than I had achieved on the spindle, but for a first try on the wheel I think it’s pretty decent! 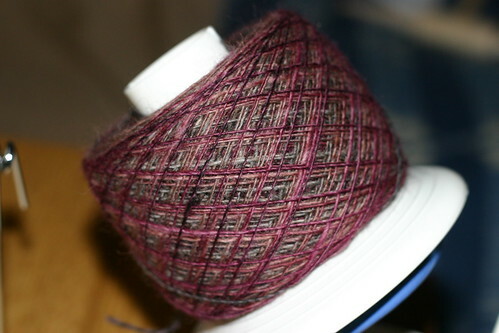 Since I had only one bobbin-full, I used the center-pull ball method of plying. 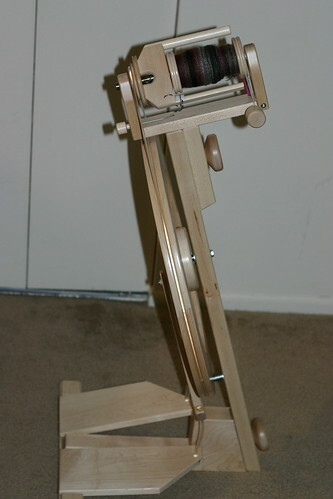 It’s nice to have a ball winder! 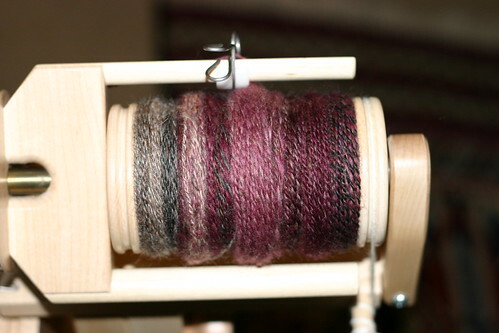 Here it is, plied up on the bobbin. 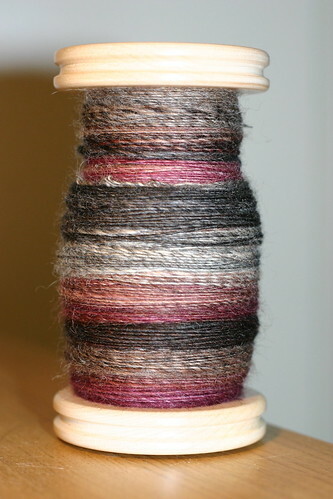 As I was spinning the singles, I thought I was waaay overspinning, but as I plied it up, many sections were underspun to the point of singles breaking. So next time I’ll try to add even more twist! I need to work on filling the bobbin more evenly. Maybe a Woolee Winder some day! Kristina was nice enough to send along a niddy noddy with the wheel. 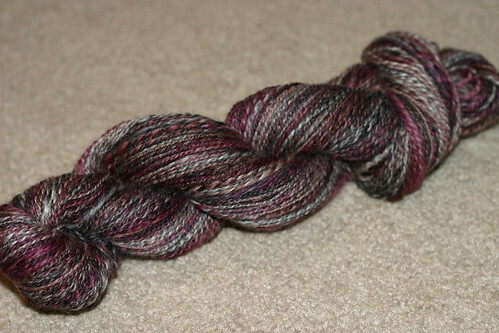 And here it is skeined up! I’m so happy!! As Pam’s husband, I just want to say that knitting and spinning are cool hobbies. Also, she writes just like she talks. And Timmy really is that cute. Congratulations on the wheel! That’s exactly what I have and I love it! Enjoy! Very nice! Good progress too! Scratch that, fantastic progess. My first wheel handspun was nothing near that!